Rigid mountain bikes make great touring rigs thanks to their ample tire clearance and plethora of accessory options. You can find racks and bags and lots of other helpful doodads for these types of rigs, but their geometry makes mounting fenders tricky task. Because most mountain bike frames are designed to accommodate suspension forks, their rigid equals have especially high crowns. Attaching a full coverage fender here will leave a large gap between it and the tire, reducing its effectiveness and looking silly in the process. You could fill in that gap with some sketchy, MacGyvered apparatus, but we’d like to think that granddaddy MacG would prefer something more functional if he had the option. 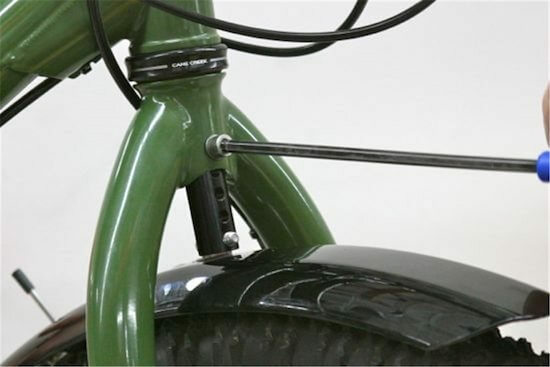 So, we created the Problem Solvers Fender Flute to give you a more structurally sound option for attaching full fenders on suspension corrected forks. 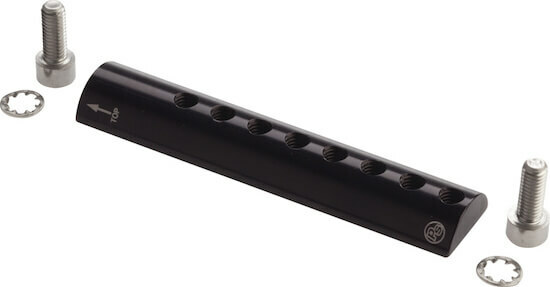 The Problem Solvers Fender Flute includes bolts and serrated washers help hold everything together. 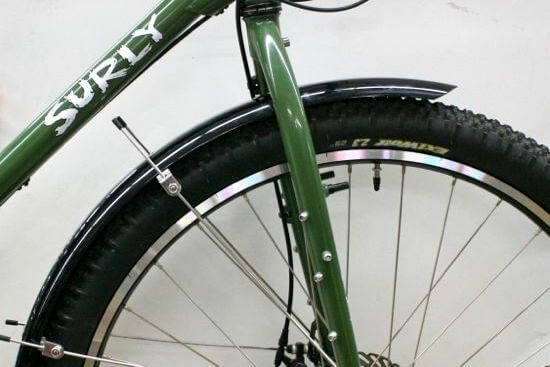 The Fender Flute is a small steel attachment that fits inside the steerer tube of your fork to provide a lower mounting point for your front fender. It features seven threaded holes for a range of mounting positions, and can fill a maximum gap of 75 mm. The curved side fits the inner wall of a 1-1/8” steerer, while the flat side provides a firm surface for the fender’s L-bracket to tighten on. This makes using the Fender Flute just as stable as attaching directly to the crown itself. This kit includes the flute, two M6 bolts with serrated washers, and is intended only for use with metal bladed fenders and fenders with quick-release stays. 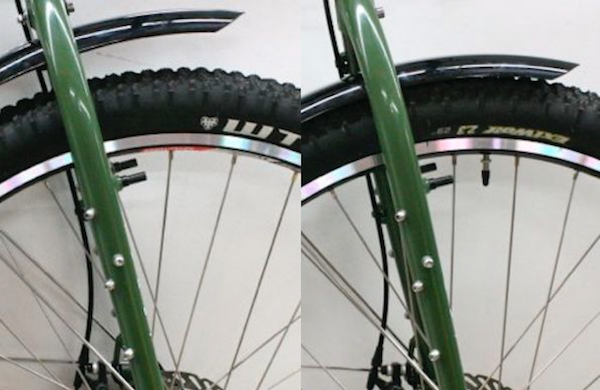 Attaching a full-coverage fender to a suspension corrected fork leaves a large gap that water can fly through. 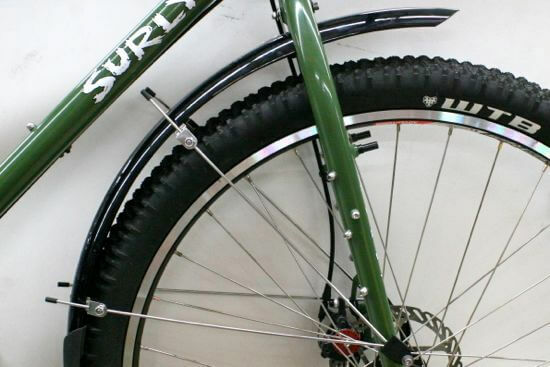 The Fender Flute moves the fender mounting position closer to the tires. 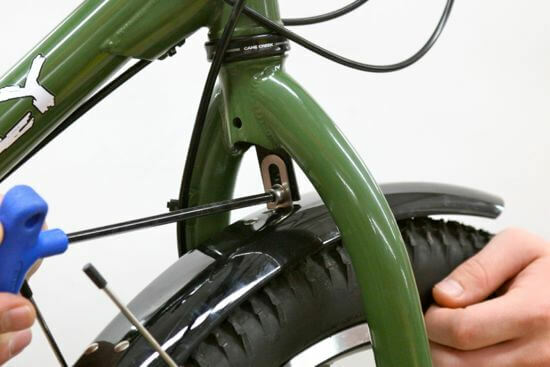 Adjust the fender to get the exact fit that you need. Slide the Fender Flute inside of the fork crown and attach it at the desired length with the second M6 bolt and lock washer tightened to 5.1Nm (45 in-lb). (figure 2). If your fender is still too high (or touching your tire), remove the M6 bolt from the fork crown, adjust the Fender Flute until the fender is at the correct height and tighten to 5.1Nm (45 in-lb). You’ll want full clearance for the tire, with a consistent radius, and no less than 6mm clearance between tire and fender. Attach the fender struts per the manufacturer’s instructions and always make sure that your fender hardware is tight before each ride. Just like that, you’ve got a proper looking (and fitting) full coverage fender for your suspension corrected ride. Old Angus would be proud. Got a Fender Flute as part of your fresh looking wet-weather setup? Tag us in your bike photos on Instagram @ProblemSolversBike and we’ll share them with the world! And submit any other bike problem solutions here. Then check back soon to see more!